Inspired by David's posting on Trust Metrics, I present below my "buddy graph" that I've been working on but hadn't published yet. Seemed as good of a time as any to do so, even though it's "out of order" for the blog. Like/dislike and good/bad are the domains of the Feeling mental function. In the people browser that is Mu, every person encountered is automatically graphed on a two-dimensional "buddy chart" (a misnomer, since it includes 'enemies' and not just buddies). Once a person is encountered, an opinion of said person is registered (even if it is 'no opinion') by a private 'tagging/reputation' protocol. 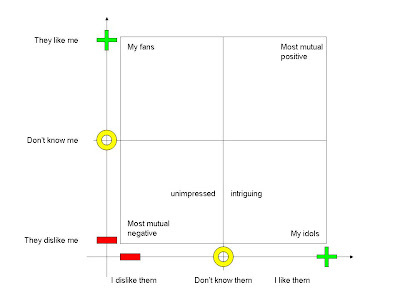 If the individual has access to others' opinions of himself (via a P2P profile/reputation system), all people encountered can be graphed in two dimensions, making it much more robust than most friendship circle diagrams (a simple yes/no Thinking approach to a Feeling function). People who haven't been 'encountered' yet begin at the center point. A simple viewing of one's profile begins their migration over the graph over time. So while a simple list of 'yes' people is the default view of an IM program, this encounter graph is the default view of Mu. A third dimension can be illustrated if reputation scores are publicized to the global communal, or peer (individual communal) group, and I'll show that illustration tomorrow.